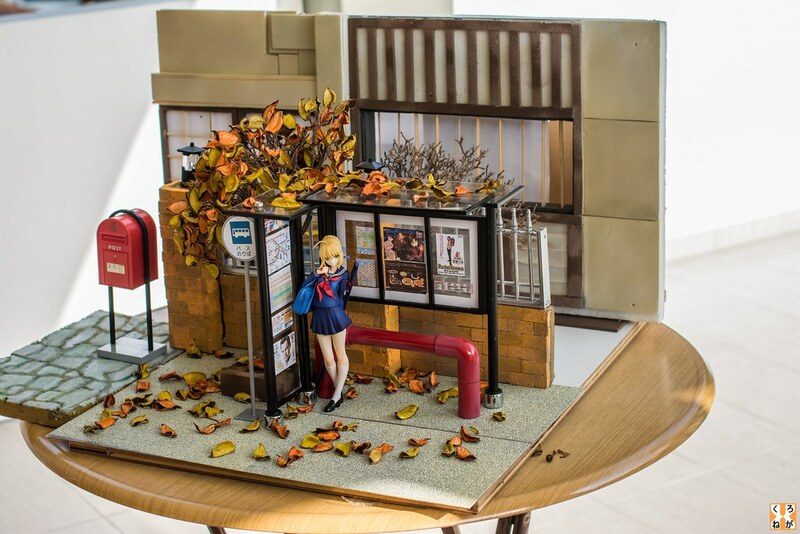 Hand-built diorama setup for Master Artoria, which is taken outdoors for the photography process. Set somewhere in Japan, at a bus stop outside of a dojo in the evening during autumn, to mark the start of the fall season this month. Shot with Nikon D5200 and Sigma F1.4 50mm EX DG HSM lens. Despite being "somewhere in Japan" the mailbox and the fencing aren't exactly Japanese. It's an indirect homage to fate/stay night, which Saber was a warrior/king of Britain, but was summoned to the existing modern world in Japan as a servant, using this concept itself i purposely mix and matched japanese with western elements. The mail box is not visible in most of the photos anyway, i placed it there simply because it looked a bit empty. Beautiful picture and I love the small details. Great work! EXkurogane (2 jaar geleden) #14503374Thanks. =) Next one will be up not long after i hit my 3rd year anniversary on the 16th of this month; 3 years ago on this day was the day i bought my first camera. It will be Saber, round 2. Sakura Saber to be precise. Wooooow !!!!! *o* I love this pic !!! !